A young woman, fresh out of high school and pregnant with her teacher's baby, joins an eccentric billionaire's utopian Infinity Family Project, in which ten children are raised collectively. Good novels are constructed; they may seem effortless in their design, but they are planned as purposely as a well-built house. Good stories have an admirable architecture, and both an apparent and transparent craftsmanship. In a novel, the construction counts. Kevin Wilson knows how to construct a story ... Remember 'Harrison Bergeron,' that Kurt Vonnegut short story about forcibly handicapping people to achieve equality? And if you’ve read Margaret Atwood’s razor-sharp dystopian novel The Heart Goes Last, you’ll get the feeling — as I did, only three chapters into Perfect Little World — that poor Izzy is in a dysfunctional family experiment ... As you might imagine, Izzy’s contact with 'normal human interaction' is fleeting. I’m not giving away what happens to the money source behind the Infinite Family Project. I’ll just say you should watch out for matriarchs of family fortunes ... It’s a novel you keep reading for old-fashioned reasons — because it’s a good story, and you need to know what happens. But you also keep reading because you want to know what a good family is. Everyone wants to know that. Wilson aims for 'a weird kind of postmodern fairy tale' — like an animated Edward Gorey cartoon, with a more realistic contemporary setting and a warmer, lighter touch. Perfect Little World is at its most charming while exploring the dynamics of group parenting ... Wilson also enjoys poking fun at the size of his cast of characters. The novel is prefaced with a faux-genealogy chart tracing the relationships between Dr. Grind, his three research assistants, the 10 babies, and their 19 parents ... Fans of the sharper irony in The Family Fang may find Wilson’s new novel a tad sappy. But just a tad. For the most part, Wilson pulls off his sweet-and-tart tone. Fortunately for us readers, the experimental ideal community that Kevin Wilson brings to life in his second novel, Perfect Little World, has the delicious makings of a mess from its very inception ... Wilson richly imagines the mundane details of life in the futuristic compound, as well as the bumpy personalities of the other parents, all of whom, except Izzy, are coupled ... Wilson is such an inventive and witty writer, that it was only after I'd finished Perfect Little World and was no longer caught up in the story, that I realized how many ideas he raises here, how many kinds of family arrangements he scrutinizes, among them biological, chosen, nuclear, communal, broken and bandaged. The utopian Infinite Family Project may be flawed from the get-go, but Wilson's 'perfect little world' of a novel pretty much lives up to its title. 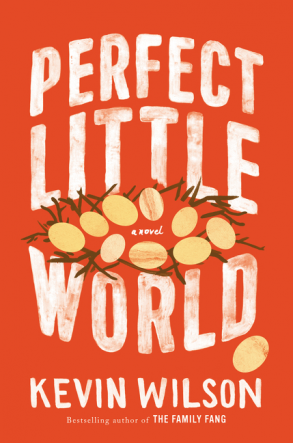 What did you think of Perfect Little World?